Management of BPI released a statement regarding the P211 Million account of Duterte! Home / News / Management of BPI released a statement regarding the P211 Million account of Duterte! 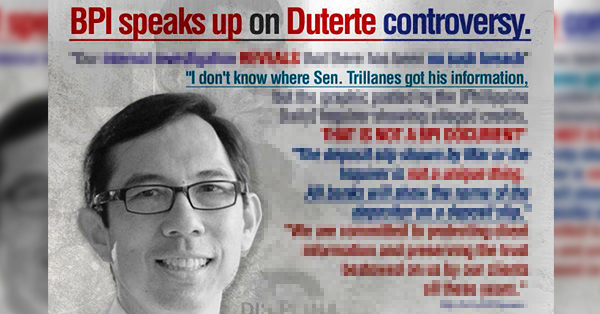 Recently, the online community has been arguing about the topic of Duterte having P211 Million Pesos in his bank account as revealed by Sen. Trillanes. These allegations created a debate on social media sites between the anti and pro-Duterte. But now, the breach that was first claimed by Trillanes has been denied by the Bank of the Philippine Islandes. The Managing Director and Chief Financial Officer of the Ayala Corporation, Jose Teodoro Limacaoco released his official statement regarding the debate. 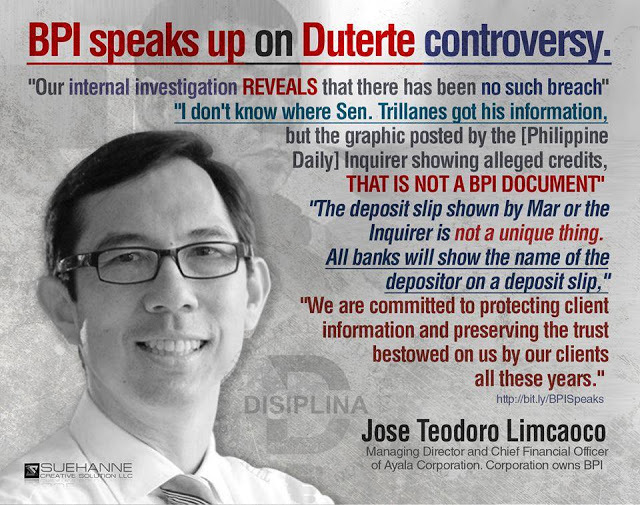 The official Facebook account of the BPI posted a statement regarding their client confidentiality.